Clif Bar delights in creating and savouring wholesome, delicious food. As bakers by trade and gourmet cooks on the side, Clif is are energized by the joy people experience when they savour great food made with care, as athletes, they're committed to creating foods that sustain, nourish and support people through any endeavour, as concerned individuals, they want their business to contribute to a healthier, more sustainable planet. These ideals inspire and motivate the work at Clif Bar, Inc.
Food that comes in a package can be wholesome. You shouldn't have to enlist a scientist to understand the ingredients on the product's label. From the beginning, Clif's commitment has been to creating all natural foods with no artificial flavours, colors, or preservatives. To that end, Clif uses whole oats, fruits, nuts, and seeds. The reason for doing so is simple: whole foods provide the most complete, balanced nutrition. Natural foods also retain more antioxidants, phytonutrients, and essential vitamins and minerals than highly processed or refined foods. And, research shows that natural, whole foods like Clif products are just as effective in delivering immediate and sustained energy for athletic performance as highly processed bars. THE RESEARCH IS IN...Organic Foods are better for people's health and for the planet. Organic foods are grown without toxic pesticides, chemical fertilizers, genetically modified organisms or artificial hormones. Organic farmers use ecologically sound practices to improve soil fertility and avoid pests and disease. conventional foods. Eating a diet rich in organic foods can significantly reduce people’s exposure to pesticide residues. Organic farming promotes healthier, safer farm communities by reducing exposure of farm workers and farm families to toxic chemicals and neighboring communities to pesticide drift. Organic farming restores soil fertility, reduces soil erosion and helps protect the health of our air, water, and wildlife. Organic agriculture also protects biodiversity by avoiding the use of genetically modified organisms (GMOs) and by enhancing natural wildlife habitats on the farm. Organic farming is a powerful tool in the fight against global warming. It uses one-third to one half less fossil fuels than conventional farming and stores up carbon in the soil instead of releasing it to the atmosphere. Clif Bar is working to reduce their ecological footprint in everything they do, from the ﬁeld to the ﬁnal products... This means that in their day-to-day work, Clif thinks about more organics, less packaging, more planet friendly transportation, less landfill, and partners that keeps Clif Bar on their toes. Clif Bar wanted a simple approach in an energy bar—not complicated formulas or gimmicks. Don’t you? It’s just an approach that makes sense. That’s why we believe in using healthy ingredients, such as organic rolled oats, organic roasted soybeans, organic milled flaxseed and organic soy flour. All 9 CLIF BAR flavours available in Canada, are made with 70% organic ingredients. It's your body, you decide™. It’s the first bar we made, and it’s still everything we’re about. Whole, organic ingredients. Performance nutrition. And great taste. Whether you’re on a 150-mile bike ride or exploring a new trail, this energy bar is built to sustain your adventure. Know what that means? You keep going. Eat a CLIF BAR 1 – 2 hours before a workout or race, and you’ll avoid the sugar high and crash associated with refined ingredients and sweeteners. A CLIF BAR delivers the boost you need without unwanted crash and burn. You don’t have to be an athlete to enjoy a CLIF BAR, but with the extra energy a CLIF BAR provides you may find it hard not to be. Who knew energy could taste this good? We want a simple approach in an energy bar—not complicated formulas or gimmicks. Don’t you? It’s just an approach that makes sense. 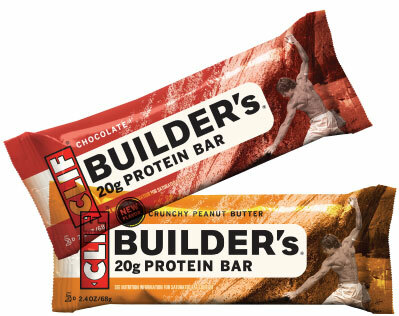 Product Information - Clif Builder's Bar The Protein Bar that works as hard as you do! Clif Builder's is the greates tasting protein bar that makes every ingredient count - so you can get the most our of your workout. You put everything into your workout. Get everything out of it with BUILDER'S BARS. Gel is a fast-acting, easy-to-digest source of carbohydrates - your body's preferred source of fuel during activity. SHOT Gel’s semi-liquid form shines in situations when you’re working hard and need to fuel up between breaths. CLIF SHOT's® goal is to provide the best tasting and scientifically-backed products that are made with sustainably-grown ingredients. We believe that energy products can taste great and can utilize organic ingredients that have positive environmental impacts. It’s that simple. SHOT Gel is the first energy gel on the market to go Organic. Each flavour uses at least 90% organic ingredients. This means that SHOT Gel's not only good for you, but also good for the planet. CLIF SHOT Energy Gel is the only gel featuring the patented Litter Leash in its packaging—a feature that makes it much easier to open a gel and dispose of it properly. With the Litter Leash, the gel tear tab stays attached to the bottom of the package after use so you don’t have to worry about trashing our roads and trails while you fill up on nutrition. SHOT® Bloks™ chews offer very similar nutrition to SHOT Energy Gel. The primary ingredient for both is brown rice syrup which provides easily assimilated carbohydrates for working muscles. Both products also provide the mineral salts. These mineral salts allow electrical impulses to travel properly throughout your body, permitting normal bodily function. When you sweat, you start to deplete your mineral sales and experience potential performance decline, so it’s best to help replenish them through food and fluid intake. Lose too much and performance declines dramatically, including a higher likelihood of muscle cramping. Clif created SHOT® Bloks™ chews, each in a 10g size, so that 3 chews provide 100 calories. That makes it easy to track caloric intake during long outings. There are 6 chews to a double-serve package, so one package provides 200 calories. CLIF SHOT® BLOKS™ chews are the first product in the SHOT® line to be USDA certified organic, which means that each flavour contains a minimum of 95% Organic ingredients. Clif strives to use the most sustainable ingredients possible in our products. The environmental benefits of buying organic ingredients for Clif products have a direct positive impact on the air and water quality on this planet. CLIF SHOT® BLOKS™ chews are USDA certified organic by Quality Assurance International (QAI). LUNA was created in 1999 as a response to requests from female fans of Clif Bar and the women here at our office. They wanted a bar with fewer calories and women-specific ingredients-and no bar like that existed. With just 180 calories, each LUNA bar contains 23 vitamins, minerals and other nutrients that contribute to a woman's overall health.